PHOENIX — The Arizona Diamondbacks got two pieces to bolster their bullpen just before the non-waiver trade deadline, a big-time start from Zack Godley and reclaimed their spot atop the NL West on Tuesday. Arizona (60-49) overtook the Dodgers (59-49) for first place when Los Angeles fell 1-0 to Milwaukee. That came hours after the Diamondbacks added relievers Brad Ziegler and Jake Diekman via trades. Diekman was acquired from the Rangers and was driven from one clubhouse to another by Arizona’s bullpen cart. A.J. Pollock’s first-inning homer cleared the high wall in center field, his 15th of the year and the 24th that Colon has allowed. Arizona took a 2-0 lead on Paul Goldschmidt’s two-out double to drive in Jon Jay in the third inning, then Ahmed made it 4-0 in the fourth when he lined his double into the left field corner to score Steven Souza Jr. and Daniel Descalso. “I got down 0-2 and was able to battle to 3-2 to get one more over the plate to drive,” Ahmed said. The Rangers’ four-game winning streak came to an end. Diamondbacks OF David Peralta was held out of the lineup with right shoulder tightness for the second straight night. … RHP Shelby Miller was transferred to the 60-day disabled list with elbow inflammation as part of the roster move to make room for Ziegler. … LHP Andrew Chafin was placed on the paternity leave list. 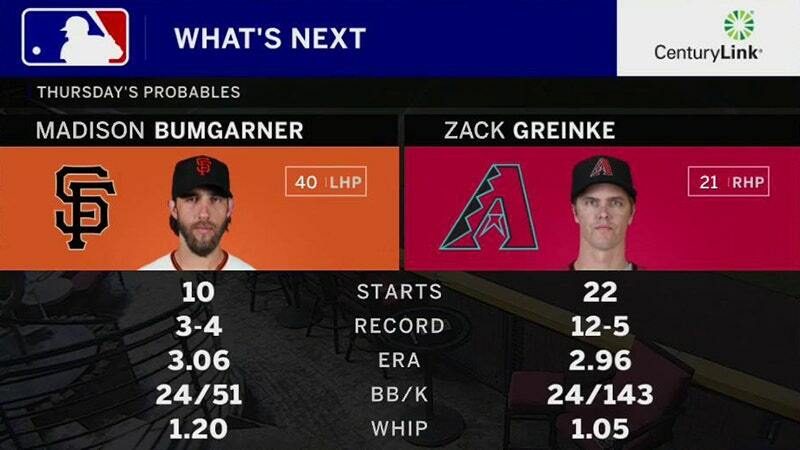 Diamondbacks RHP Zack Greinke (12-5) pitches the opener of a four-game series against San Francisco on Thursday. He’s 12-2 in 18 career starts against the Giants, who will counter with ace LHP Madison Bumgarner.